University of Madras is a public state university in Chennai (formerly Madras), Tamil Nadu, India. Established in 1857, it is one of the oldest universities in India. The university was incorporated by an act of the Legislative Council of India. It is a collegiate research university and has six campuses in the city viz., Chepauk, Marina, Guindy, Taramani, Maduravoyal and Chetpet. At present, there are 233 plus courses offered under 87 academic departments grouped under 19 schools, covering diverse areas such as sciences, social sciences, humanities, management and medicine along with 109 affiliated colleges and 52 approved research institutions. It is one of the top Universities in India that provide distance education in various disciplines. The National Assessment and Accreditation Council has conferred 'five star' accreditation to the university and it has been given the status of 'University with Potential for Excellence' by the University Grants Commission. University of Madras is the alma mater of two Indian Physics Nobel Laureates, CV Raman and Subrahmanyan Chandrasekhar, five Presidents of India, including A.P.J. Abdul Kalam, and several notable mathematicians including Srinivasa Ramanujan. The first ever demand for higher education in Madras Presidency was given in a public address to Lord John Elphinstone, Governor of Madras, signed by 70,000 residents when the Governor in Council was contemplating "some effective and liberal measures for the establishment of an improved system of national education." This public petition, which was presented by the Advocate General Mr. George Norton on 11 November 1839, pressed the need for an English college in the city of Madras. Pursuant to this, Lord Elphinstone evolved a plan for the establishment of a central collegiate institution or a ‘university.’ This university had twin departments – a high school for the cultivation of English literature, regional language, philosophy and science, and a college for instruction in the higher branches of literature, philosophy and science. The University Board was constituted in January 1840 with Mr. George Norton as its president. 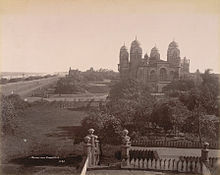 This was the precursor of the present Presidency College, Chennai. A systematic educational policy for India was formulated 14 years later by Wood's despatch, which pointed out the rationale for "creating a properly articulated system of education from the primary school to the University." The Dispatch recommended the establishment in the universities of Professorships "for the purposes of the delivery of lectures in various branches of learning including vernacular as well as classical languages." As a result, the University of Madras, organized on the model of the University of London, was incorporated on 5 September 1857 by an Act of the Legislative Council of India. The university progressed and expanded through the 19th century to span the whole of South India, giving birth to universities like Mysore University (1916), Osmania University (1918), Andhra University (1926), Annamalai University (1929), Travancore University (1937) presently University of Kerala, Sri Venkateswara University (1954), Madurai Kamaraj University (1966), Bharathidasan University (1982), Bharathiar University (1982), Manonmaniam Sundaranar University (1990), Tamil Nadu Agricultural University (1971), Anna University (1978), Tamil University (1981), Mother Teresa Women's University (1984), Dr. M.G.R. Medical University (1989), Veterinary and Animal Sciences University (1989), Periyar University (1997) and Dr. Ambedkar Law University (1996). In 1912 endowments were made to the university to establish departments of Indian History, Archaeology, Comparative Philology and Indian Economics. In that year the university had 17 departments, 30 teachers, and 69 research scholars. Later the research and teaching functions of the university were encouraged by the Sadler Commission and the gains of the University were consolidated by the enactment of the Madras University Act of 1923. About this time, the territorial ambit of the Madras University encompassed from Berhampur of Odisha in the North East, Trivandrum of Kerala in the South West, Bangalore and Mangalore of Karnataka in the West and Hyderabad of Andhra Pradesh in the North. Between 1926 and 1939, the university published the comprehensive Tamil Lexicon dictionary, which is the first among the dictionaries published in any Indian language. In Senate House: A view of the Madras Legislative Assembly in 1937. "Argent (silver or white) on a Mount issuant from the basement a Tiger passant proper (walking and coloured naturally), on a Chief Sable (black across the top), a Pale Or (a gold or yellow vertical strip down the centre 1/3 of the top or chief), thereon, between two Elephants heads couped of the field, a lotus flower leaved and slipped of the third, together with this motto Doctrina Vim Promovet Insitam". The coat of arms colours are: the base is light green, the tiger is yellow on a white background, the elephant is grey on a black background, the lotus is a white flower with olive green leaves, on a gold background. The motto scroll is edged red, with black lettering. The English translation of the motto of the University of Madras is: "Learning promotes natural talent." The university is spread over six campuses, viz., Chepauk, Marina, Guindy, Taramani, Chetput and Maduravoyal. The Chepauk campus of the university houses the VC's secretariat, central library, centenary auditorium and the historic Senate House. The oriental and Indian languages departments are located in the Marina Campus. The Guindy campus incorporates the natural sciences departments while the campus at Taramani houses the school of basic medical sciences. The sports union and the botanical garden are based in Chetpet and Maduravoyal campus respectively. The university has two constituent college, in Nemmeli and Thiruvottiyur, offerings courses in arts and science. The University of Madras has a historical monument – Senate House – which is one of the landmarks of the city of Chennai. The Senate House, the University's first building, inaugurated in the year 1879, is a masterpiece of Robert Fellowes Chisholm, an architect of the 19th century, who blended the Indo-Saracenic style with Byzantine and European architectural features. The university renovated the Senate House in 2006. University of Madras has a strong alumni network with its alumni taking over many prestigious positions across the world. Some of the prominent alumni include Nobel laureates C. V. Raman and S. Chandrasekhar, mathematicians Srinivasa Ramanujan and S. R. Srinivasa Varadhan, former presidents Sarvepalli Radhakrishnan, V. V. Giri, Neelam Sanjeeva Reddy, R. Venkataraman and A.P.J. Abdul Kalam, politicians Chakravarthi Rajagopalachari, C Subramaniam, CN Annadurai and V. K. Krishna Menon, civil servants T. N. Seshan, Benegal Rama Rau and Y. Venugopal Reddy, pioneers Verghese Kurien, Raj Reddy and M. S. Swaminathan, economist K. N. Raj and C. Rangarajan, business persons Indra Nooyi, Ram Shriram and Prathap C. Reddy, cinema actors and directors M.G. Ramachandran, Gemini Ganesan and Mani Ratnam, sports stars Viswanathan Anand, Vijay Amritraj,,National Assembly of Bhutan Speaker Wangchuk Namgyel and Ramanathan Krishnan among others. Internationally, the university was ranked 171-180 in the QS University Rankings BRICS University Rankings of 2018. In India, the National Institutional Ranking Framework ranked it 29 overall and 18 among universities in 2018. A study performed by the National Institute of Science, Technology and Development Studies on the performance of universities in India in 1998-2008 listed Madras University as #5 based on publication for that period. In 2011, the University Grants Commission selected the university as a university with potential for excellence, under which the university gets ₹ 250 million (₹ 25 crore). The university had been selected under phase 1 of the scheme in 2001–02 along with a few other universities in the country. UGC has identified the school of geology and the school of zoology of the university as centres of excellence and has allotted ₹ 32.5 million (₹ 3.25 crore) each for their development. The university is planning to use the funds to buy equipment and improve infrastructure. ^ Indian Universities in the 2014 QS University Rankings: BRICS. Top Universities (24 June 2014). Retrieved on 2015-09-27. ^ University of Madras. Encyclopædia Britannica. ^ University Grants commission ::Universities (UPE). Ugc.ac.in. Retrieved on 27 September 2015. ^ "The Vice Chancellors". University of Madras. Retrieved 17 June 2013. ^ Great Britain. India Office. "The India List and India Office List for 1905". p. 634. Retrieved 27 March 2018. ^ Kolappan, B. (22 June 2014). "Delay, howlers in Tamil Lexicon embarrass scholars". The Hindu. Chennai: The Hindu. Retrieved 25 December 2014. ^ "Measures of Performance of Universities in India: An Analysis of the Publication Output in Science and Technology (Study period 1998-2008)" (PDF). National Institute of Science, Technology and Development Studies. 2011. ^ "UGC selects Madras univ as potential centre of excellence, grants Rs 25 cr". The Times of India epaper. Chennai: The Times Group. 29 December 2011. Retrieved 30 December 2011. Wikimedia Commons has media related to University of Madras.